Pedaling the road: The voice in ear - helpful? Becoming king - or should I at least say Sir? When you're out on the road, how do you encourage yourself during the most intensive workouts? Do you picture yourself in a break two kilometres from the finish line as Peter Sagan is closing in on you? Or perhaps you are picturing Lefevere or Madiot behind you in the team car yelling "Allez! Allez!"? From time to time anybody enjoys a bit of help on the way, right? A tiny motivational voice somewhere far back, whispering words of encouragement along the way. For a recreational cyclist, this voice, if you have heard one, is probably your own swearing or your annoyingly fitter friend you (at the time) would like to go somewhere the sun does not shine. For a professional cyclist it can be just the same (probably not with the fitter friend but who knows). Suffering is equally hard and not depending on fitness level, there is a saying that climbing hills don't get any easier the more fit you are, you're just going faster. Some riders, like Dave Zabriskie, doesn't want any feedback at all during his TTs. Zabriskie's suffering takes place internally, according to Allen Lim, who used to be Garmin's team physiologist, said that "When he's in a time trial, he thinks of himself as a superhero". Not exactly Marc Madiot-style that's for sure. 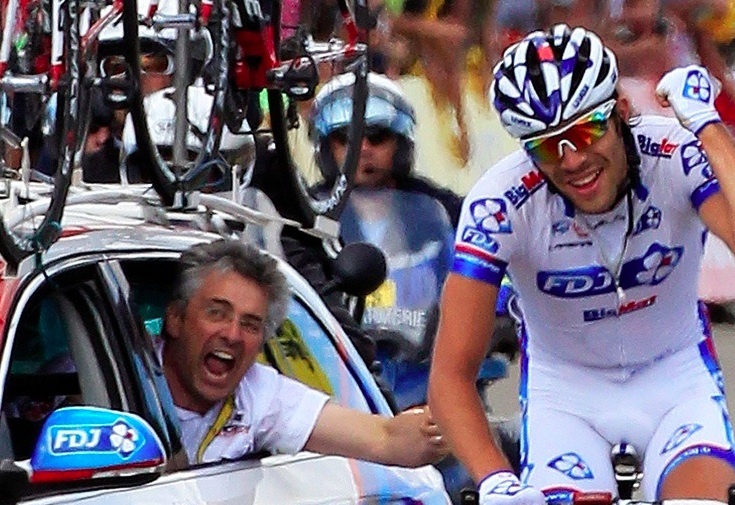 Whether young Thibault Pinot enjoys this kind of encouragement is unknown. As is if he had any choice I might add. 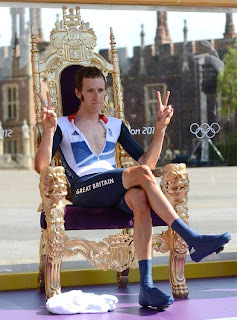 Bradley Wiggins has a totally different approach than Dave Zabriskie. Constant feedback on time gaps relative to major competitors, distance to climbs, any obstacles and so forth. In the interview below where Wiggo speaks about the Olympics TT, (video tweeted by Rich Land earlier today), Wiggins says that Sean Yates, "who's been in the car all year (...) came down for the day." Never change a winning team, it's all about marginal gains, eh? Next time you're out there on your favourite climb, try saying some calculated words to yourself. Before you take that ride, take a couple of minutes to visualize yourself going up that hill. Imagine what you see, what you smell and hear and above all - how good you feel. When climbing, grab a second here and there. 30 seconds after you are on the top of the climb, the pain is gone. How do you want to feel like when you are done? If this doesn't work you can always download Madiot's monologue, it will probably do the trick too.